Beth’s insights on how to better connect within your family – Great for parents, children, and other family members wanting to improve their relationships. When I am teaching and working with families, I often have parents question what they are doing as a parent. They ask me what they are doing wrong and how to better connect with their children. A few questions I share with them are listed below. My purpose is to take you back to a more basic foundation of what we are supposed to teach our children. We have come to live in a material society and we often forget the most basic fundamental lessons that are most important. My personal goal has always been to teach my children to believe in themselves by following their dreams and living their passions. My desire is that you will connect with these questions and hopefully they will open a new door in your relationships. As my children move on in their lives and careers, I wonder. Did I teach them everything I could? Did I love them enough to know what real love is? Did I give them the tools needed to get themselves through any situation life hands them? Did I inspire them enough to reach for the top of any mountain? Did I show them how to have faith through the worst of times? Did I teach them that the scars we carry only serve as a reminder of where we have been, not where we are going? Did I encourage them enough to “Live their Passion” in life? Did I show them how to be confident, even when they may be scared on the inside? Did I teach them that laughter can relieve more stress than crying about it? Did I tell them to smell the flowers and watch the sun set and rise? Did I teach them not to wait for their dreams to happen to them? Did I show them that hard times are usually the ones we appreciate the most? Did I teach them that love is always stronger than hate? Did I show them that truly living life is a choice? Did I teach them to not procrastinate? Did I remind them that life’s clock is ticking by and it stops at the moment it is meant to. Did I remember to teach them that? 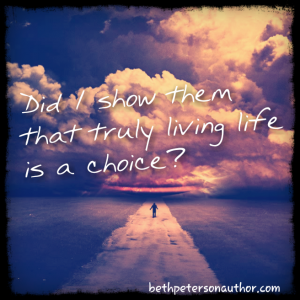 Beth Peterson offers advice and insight on topics such as family and what it means to be a mother, daughter, and sister; the trials of personal loss and joys of spiritual recovery; and lessons on discovering true meaning and direction in life. Her desire to encourage others to understand self-healing in a supportive environment comes from first hand experiences as a two time lightning strike survivor.